businesses in a way that is profitable and focused on your success. By 2020, the global B2B E-Commerce market is supposed to generate about 6.7 trillion dollars – which is twice of what is expected from the B2C market. Whether you’re planning to join B2B marketplace or already have B2B online store and require a b2b ecommerce developer, you’ve landed the right place! We offer b2b ecommerce solutions for businesses at every stage; from planning to designing to developing and to expanding. Equipped with a team of certified b2b developers, we build and maintain quality e-commerce solutions on all the major b2b ecommerce platforms – Magento, Shopify, NetSuite, WooCommerce, Zen Cart, Drupal Commerce, and Volusion. We deliver scalable and robust custom b2b ecommerce store development services and ecommerce development solutions along with extensions development, theme customization, and maintenance services. We keep in touch with the current industry trends to offer up-to-date ecommerce development services. We have an experienced team of b2b ecommerce experts equipped with the tools you need to increase conversion, optimize marketing strategies & expand your business. We develop end-to-end b2b ecommerce solutions that are efficiently integrated with your website impressively. We believe in timely delivery & result driven solutions along with enterprise quality. As leading ecommerce development specialists, we have domain expertise and market knowledge required to offer b2b ecommerce strategy, integrations, migrations and support, and a full range of b2b ecommerce development services. B2B enterprises all do business in their own unique style. Some ecommerce businesses may want to fully automate their sales and offer a self-service web-store while other cannot process orders without buyer-seller interactions. Other merchants may need to establish a B2B Marketplace where brands can promote an ecosystem of complementary 3rd-party products and services to supplement their offering. Some companies may even need the ability to do all three. The need to support all of these online use cases differentiates the B2B eCommerce definition from B2C. We at Rave, provides a full suite of b2b ecommerce development services. We streamline delivery, designed to match your b2b business goals, your timeline and your budget. We can help manufacturers optimize online operation to sell to distributors as well as sell directly to customers. It is more important than ever for distributors to streamline operations through ecommerce online ordering. We can deliver an exceptional online experience allowing your customers to get the best prices possible. each serving different B2B customers, allow you to tailor what you sell and whom you sell it to. 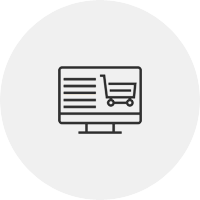 Set up multiple price lists per catalog to provide you with e-commerce business flexibility. Custom navigation schemes and product organization per catalog deliver an optimal customer experience. Thumbnail, gridline, and item detail views enable you to showcase your brand. Discounts and special offers drive higher e-commerce sales volumes; customizable up-sell and cross-sell promotions increase sales order size. Multiple currency support enables you to take orders whichever way your customers wish to pay. Our customers love the new site and our online sales continue to grow year over year. If you are looking for a partner instead of a vendor, Rave team is your answer. Director of IT at National Oak Distributors, Inc. Rave is a professional shop where deliverables come on time and on spec - consistently. Rave’s experts clearly care about the work quality and, ultimately, the well-being of the clients. Would highly recommend Rave Infosys to anyone looking for quality software development services. Rave and its team are responsive, detail oriented and affordable. Incredibly talented and reliable.